The electronic media beamed images of thou-sands of people from the North-East climbing on to trains at Majestic Railway Station in Bangalore heading home to Guwahati. This panic was caused by anonymous SMSs warning that the Muslims would attack them after the month of Ramzan. On the first day 6500 young men and women from the North-East booked tickets for Guwahati but soon the figure reached 30,000. There were reports that similar reactions were happening in Pune, Hyderabad, Chennai and there were also reports of violence in Lucknow, Allahabad, Kanpur and then Mumbai. None of the news made any sense and more we listened to the TV shows the less we under-stood. In one interview Mary Kom mentioned it had all to do with land but the anchor did not ask her what she meant. Instead they asked her how she managed to balance her role as a mother with her ambitions in boxing. On the day Mary Kom was on national TV, four people from her tribe were beaten in Bangalore by five assailants. They were rescued by their Muslim landlord who caught the miscreants and dragged them to the police station. There they discovered three of them were Tamil Hindus and two were Muslims (I could not find out from where). The two communities who were at the heart of this conflict were the Bodos and the migrants from Bangladesh. We saw them in refugee camps and in distress but their grievances, their demands and their voices were not heard. Only recently the World Bodo Historical Society has called for a ban on the Vaishnav religious social reformers, Sankardev and Madhavdev, because in their books they instigated people to wage war against the Mleccha (or Mech) and Buddhists. “Mleccha” is a derogatory term in Sanskrit for an untouchable. There is a history of centuries of humiliation on these once powerful tribes who had Kingdoms right down to the time of the Indian Independence. One of these, Rajbanshi-Koch Kingdom of Cooch Behar was a dynasty with ancient origins. This Kingdom was established in the 16th century and remained a Princely State till 1950 when it was incorporated into West Bengal as a district. The Rajbanshi had a Kshatriya movement in an attempt to claim high-caste status but they have been recognised as one of the Scheduled Castes under the Indian Constitution. Some Koch-Rajbanshi youth have taken to arms and are fighting for a separate State. This is called the Kamatapur movement. Kamatapur was their ancient kingdom and the rulers of Cooch Behar called themselves Kamateshwar. It was this movement that was blamed for the first attack on a Bangladesh Muslim village on July 6, 2012 which led to the subsequent violence between the Bodos and Bangladeshi migrants. At least that is what Susil Kumar Shinde, our new Home Minister, told Parliament on August 8. He said that the Kamatapur Liberation Organisation (KLO) is behind the July 6 firing at Musalmanpara in Kokrajhar district. However, Biswajit Ray, the Advisor of the All Koch-Rajbanshi Students Union, held a press meet at Bongaigaon and condemned the Home Minister’s statement saying there was no evidence to prove such allegations and the CBI should investigate into the incident. The Bodo people (the Koch, Dimasa, Rabha, Chutiya, Kachari, Tiwa) have been fighting for their cultural identity and especially the official recognition of their language since the 1950s. It was only after they took to armed resistance in the 1990s that the government took their demand seriously and now it is a language recognised and taught in the schools and colleges in Assam; also it was included in the Eighth Schedule. There is a long history of the struggle of the Bodo people around three issues: alienation of their land and natural resources; greater political self-determination; and preservation of their culture and language. In a way the Bodo agitation can be traced to 1967 when the Plains Tribes Council of Assam was formed. The Bodos have won the right to have an autonomous area where they can have a high degree of autonomy and self-determination. But they say that the laws giving them autonomy are not effective enough to ensure their right to self-governance. That is why the Bodos are now fighting for a separate Bodoland State and have demanded that Assam be divided 50/50. The Bodo armed group, called the National Bodoland Democratic Front, has started peace talks with the Centre but a group against the peace talks has been accused of the recent violence against the Bangladeshi migrants. The violence has left nearly a hundred people dead from both communities and thousands are now living in refugee camps. The Bodos, like many tribal and non-tribal communities in the North-East, feel threatened by the growing numbers of migrants from Bangladesh. The Assamese leaders have pointed out that after Kashmir the highest percentage of Muslims is in Assam. However, the relationship between the Hindu and Muslim and tribal communities have remained cordial. It is only the influx of the Bangladeshi migrants that has caused the tension. Bodo leaders point out that the conflict is over land, political representation and cultural rights. They point to the fact that no Bodo has ever objected to the Bodo language being taught by Ismail Hussain, a migrant from Bangladesh. He is even the Head of the Department of Bodo Language at Guwahati University’s Kokrajhar campus within the troubled Bodoland Territorial Council area, the scene of violence between the Bodos and Bengali-speaking Muslims. There is a long history of people from erstwhile East Bengal coming into what is now the North-East region of India. It began during the British times when peasants were affected by the land settlement policy of the colonial rulers. Lakhs of poor peasants, who were exploited by the zamindars, left their villages and settled in the lands which are a part of the North-East. Then during the 1971 War of Liberation in Bangladesh many poor people took shelter in Assam and other North-Eastern States. It was during 1971 that the demography of Tripura changed with the local tribal communities becoming an insignificant minority. The Bangla-desh Government recognised this fact when it recently awarded the former Rani of Tripuri Kingdom and acknowledged her help during those days when lakhs of refugees poured across our borders. She had opened her palace gates and given shelter and succour to thousands of them. The mother of the present Chief Minister of Meghalaya too had given shelter to Bangladeshi refugees and was also awarded by the Government of Bangladesh. In fact the Assam movement has accepted that those people who came across to India in 1971 should be recognised as Indian citizens. 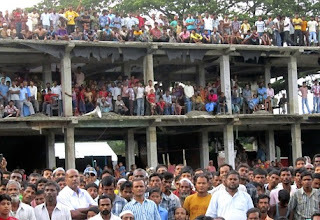 The controversy is over the continuous influx of the people from Bangladesh. One estimate puts the number of Bangladeshi immigrants at 40 lakhs while others deny their very existence. The core of controversy as far as the Bangladesh influx is concerned centres around the census figures. There is a serious question of reliability of the census figures. Many social scientists have raised questions about the Indian state’s institutional capacity to design empirically informed policies in the absence of reliable census data. There is no controversy over the fact that these migrants have contributed substantially to the economy of the various North-Eastern States by their diligence and skills. They have cleared large parts and the land they have cultivated is the most productive. They have brought with them many skills and lived by the dint of their hard work. The Bangladeshi migrants have been targets of extreme violence; the worst case was the Nellie massacre in which, according to some estimates, 5000 men, women and children were butchered. It is said the Tiwas were responsible; others blame the RSS. The fact is that Bangladeshi migrants are easy and vulnerable targets. None of the political parties offered effective protection to them even while using them as vote-banks. It was in the aftermath of that massacre that the Muslims started organising themselves into armed groups. The first was the formation of the Muslim United Liberation Tigers of Assam (MULTA). There are 23 Islamic armed groups in Assam and the North-East. During the recent violence, the All Assam Students Union (AASU) has accused the Assam United Democratic Front (now the All India Democratic Front) of communalising the issue by appealing to Muslims to take up cudgels on behalf of the Bangladeshi migrants who are Muslims. The charismatic leader of the party is Badruddin Ajmal al Qasmi, popularly known as the Perfume Baron, because he has assets worth Rs 200 crores made in the agar oil and perfume business. Ajmal won from the Dhubri constituency and is a member of the Lok Sabha since 2009; his party won 18 seats in the Legislative Assembly. Ajmal has called for the abolition of the Bodoland Territorial Council and he has support from Asaduddin Owaisi, the leader of the All India Majlis-e-Ittehadul Muslimeen. However, the 25 lakh inidigenous Muslims of Assam (as they call themselves) have formed their own organisation, called the Sadou Asom Goria Moria Deshi Jatiya Parishad (SAGMDJP); they equally blame the Hindu, Muslim and Christian fundamentalist forces for trying to wedge differences among different indigenous communities during the BTAD conflict. The SAGMDJP has demanded the arrest of Ajmal, alleging that he took the initiative of giving the Bodo-Muslim conflict a communal colour. According to the Central Government, there are more than 300 websites on which pictures, photographs and videos were posted showing Muslims being killed by some people alleged to be Bodos. In fact these videos and photographs were morphed and taken from the recent violence against Myanmar Muslims living in the Rakhine (Arakan) State. The Muslims living in the Rakhine State bordering the Chittagong State of Bangladesh are called Rohingyas. The Rohingyas came when the King of Arakan Kingdom returned from exile in Bengal after 25 years and brought with him the Rohingyas.The majority of the Arakan population are Buddhists. The Arakans have been fighting for greater autonomy and federalism within Myanmar and some have taken to armed resistance. It is believed there were some two million Rohingyas in 1978 when the Myanmar Army made them a special target of their brutalities; 250,000 Rohingyas fled to Bangladesh and became refugees. The Myanmar Army destroyed their mosques and denied their legal and constitutional rights; and at one point even declared them as foreigners. They Rohingyas were again targeted by the Myanmar Army in 1990 forcing thousands to once again to take shelter in Bangladesh. They too have organised themselves into armed groups and are trying to defend their rights. They have more recently come under attack by the Arakanese organisations and are subjected to torture and humiliation. Many have taken shelter in parts of North-East India. The Arakan organisations have a similar position as the Bodos saying that they do not object to those Rohingyas who came earlier but a continuous inflow would make the Arakans a minority. The Myanmar Government has ordered an inquiry into the recent violence which has left scores of people dead and thousands displaced. These videos and pictures were passed on through the mobile phones, MMS messages and through social networking sites such as the Facebook and Twitter. These false videos were designed to outrage the Muslims and incite them to violence. There were some reactions. The first was in Mumbai when the Raza Academy decided to organise a protest at the Azad Maidan against the killings of Muslims in Assam and Myanmar. They were given permission. The Raza Academy or the Madinat-ul-Ilm (house of knowledge) was founded by Maulana Ahmad Raza who was originally from Bihar and Rizwan Khan a scrap dealer. The organisation took the help of other Sunni Muslim organisations and that rally turned violent with the mob torching vehicles and pelting stones. Two people were killed and 14 injured. Subsequently 23 have been arrested. There are thousands of migrant workers from all parts of the North-East working in Banglalore, Chennai, Pune, Goa and Mumbai. They started getting SMSs warning them of an imminent attack on them after Ramzan. There are many North-East people living in behind Johnson Nagar in Bangalore. Several of them were told by their Muslim landlords to leave. However, quite a few landlords told them not to leave but to move in with them. There were Muslim families who gave Iftar parties to the North-East people and assured them no harm would be done to them. In fact they were all invited for Eid. But there were serious threats and attacks; isolated incidents but enough to make the anonymous threats seem real. A Tibetan was stabbed in Mysore; a Tangkhul Naga boy’s leg was broken in an attack; a Meitei was attacked; and many were threatened by strangers, in one incident there were people with swords. We still have not documented the extent of this violence against the North-East people. In Hyderabad it was the Assamese who were first threatened and at least in one security agency more than 600 of the 1000 security guards fled leaving the agency in deep difficutly. Many restaurants in Bangalore had to close down because of the exodus. The question still remains as to why so many North-East people were attacked in Bangalore and why the exodus was so great there. The BJP blamed the Congress for singling out Karnataka and insisted that no incident had occurred. In Parliament Sushma Swaraj made a passionate appeal to the people of the North-East to treat all parts of India as their home. But no one visited those who lay in hospital even though the RSS workers were working to provide water and succour at the Bangalore railway station to those waiting to get their trains back home. It still remains a mystery as to how so many people from the North East got these SMSs and how panic was created among a people known for their stoic courage. Why were the trains so readily arranged but no effective way was found to assuage the anxiety of the migrant workers from the North-East? The TV channel anchors made appeals to the North-East people living in these cities to preserve the idea of India. But the channels did not bother to try and enlighten anyone about the real problems of land, displacement and development in the North-East. The media did not bother to focus on the fears of ordinary Muslims who themselves were caught in the midst of this crisis. The Muslim community reacted with humanity. Many of the landlords took their tenants into their own homes; some called the North-East people for an Iftar party and invited them for Eid. A Muslim youth gave a moving message and put it on YouTube. In 1950-51, the per capita income of the people of Assam was 10 per cent higher than the national average. Forty years later, in 1990, it had fallen 20 per cent below the rest of India. One of the reasons is the low agricultural productivity; and the other is the lack of industrial growth. There are 5686 sick units in the State. Although the official figures say that between 1947-2000 only 3.9 lakh acres has been taken for development projects, it has been calculated that in fact 14 lakh acres2 has been taken displacing nearly five lakh people, that is, as many people have got displaced during the recent violence in the Bodo areas. The tribal and Scheduled Caste people have borne the brunt of the effects of conflicts, land alienation, rise of fundamentalism and, most of all, the bankruptcy of the political parties across the spectrum. The Government of India has announced that the bulk of the SMS messages came from Pakistan. They have blamed Pakistan for creating panic. They say that people carrying Indian passports but Pakistani hearts have created this situation in their 43-page report on how the social networking sites were used for this insidious purpose. The Hindutva group has gained by the demonisation of Muslims and many of the North-East people, especially from the Hinduised communities (which include many of the Bodos) and also those belonging to Christian fundamentalist groups could have fallen prey to the anti-Muslim propaganda by the Hindu Right. Muslims were confused by all this propaganda and did not have information about the North-East. The Muslims showed extreme restraint; so whoever tried to incite violence failed to do so and the real world realities won over the virtual world—at least this time. The electronic media, as usual, played a negative role: they did not try to inform the viewers the facts; Hindi channels sided with the Hindutva and the corporate world of NDTV and CNN/IBN made meaningless appeals to the North-East people not to panic. There was no mention of the restraint of the Muslims or highlight their gestures of solidarity to the North-East people. No one bothered to call anyone from the Bodo community; their favourite “Northeasterners” were people with “safe” views such as the former CM from Arunachal Pradesh. Now the government will be engaged in Pakistan-bashing and soon the people of the North-East will be forgotten; not that anyone tried to understand their grievances even when they said their hearts went out to our “North-East citizens”. The North East citizens were too polite to say that yes they were citizens but second-class citizens driven from their homes to work as migrant workers in hotels, restaurants, beauty parlours, showrooms, call centres and goodness knows where else. As for the immigrants from Bangladesh, they have been pushed into the embrace of the militant Islamic groups or the pan-Islamic parties who have no vision of a plural society. The other political parties, Left, Right, Centre, have already shown their bankruptcy of politics as far as evolving a vision for India of the future. The militant groups in the North-East and the people of the North-East have the task of evolving a society and polity which will have to accommodate the immigrants. The best thing that has happened, as far the peoples of the North-East are concerned, is that they have united and felt a deep solidarity for each other. Even though they may not have heard of many communities or their neighbouring tribes they came together to face the problem. And now an identity of the “Northeasterners” has been formed. The other people also learnt of the worth of the North-East people when restaurants closed in Bangalore, security agencies in Hyderabad were left without their security guards and people realised that the migrant workers are here to stay: in Goa, in Assam, everywhere. The only question is: on what terms and conditions? 1. The Bodo tribes include Rabha, Koch, Mech and many others. However, the Bodos are now a distinct tribe of the greater Bodo family. 2. Walter Fernandes and Gita Bharali, Uprooted for Whose Benefit: Development-Induced Displacement in Assam 1947-2000, Guwahati: North-Eastern Social Research Centre, 2011.